The Marines of the Colonial Fleet have one primary task: Security. Their job on board Navy vessels is to ensure that peace is kept. They do this in a few ways. First, they patrol the ship. Second, they maintain the weapons lockers and firing range. Third, they control the brig. However these directives and responsibilities are burdened with further actions during wartime. During these periods, the Marines on board will conduct counter-boarding operations as well as stand guard in various postings around that ship that during peacetime wouldn't normally require it. The Marines also conduct landing operations, their own boarding operations, and any major military engagements that don't involve shipboard weapons systems or the Air Wing. Marine Officer - There are several Marine officers on the Hestia: S1 (Adjutant), S2 (Intelligence), S3 (Operations/Training) and S4 (Logistics), and the Platoon's Commanding Officer. Master-at-Arms (MaA) - This is the senior enlisted MP on board and is also in charge of the brig as well as the small arms lockers. The MP's report directly to the MaA who is the senior 'law enforcement officer' on board. Military Police - A Marine who works directly for the Master-at-Arms normally conducting regular patrols and safeguarding the ship. These are typically Marines who's primary function on board is more police-like. Other Marines assist the MP's in their tasks, but only MP's can perform arrests. Riflemen - A basic Marine grunt who handles security and combat operations. Secondary abilities may lie with being radio operators, assistant Medics, or any number of other tasks. Combat Medic - Often referred to as "Corpsman," these are members of the Marines who have medical training in first-aid and dressing battle wounds. However, they are still proficient riflemen. Machine Gunner - A Marine who operates the larger ‘squad automatic weapons.’ These Marines also know most firearms and typically operate as techs when it comes to their repairs within the platoon. Heavy Weapons - These Marines deal with the heavier aspects of combat. They can specialize in any number of areas including explosives, anti-tank weapons, surface-to-air missile (SAM) systems or grenade launchers. Marksman - The Marksmen of the Marines are the top shots but their duties don’t always entail shooting. Much of their time in the field of combat has to do with covert reconnaissance and not killing – as most would expect. Many will refer to them as ‘snipers,’ though that term isn’t an official title. Proficient at not only shooting, they should know camouflage, survival skills, spotting, recon and other related abilities. These positions will be severely limited. 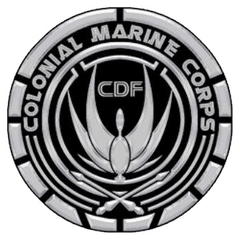 The Colonial Marine Corps (CMC) is a branch of the military, separate from the Colonial Fleet, responsible for ground warfare and naval security. Elements of the CMC were found across all Fleet vessels and stationed on all Colonial worlds, serving as a rapid response force to maintain civil order and national security. Basic training lasts for nine weeks and transforms the volunteer from a civilian to a soldier. It is an intentionally challenging and unforgiving system, designed to harden and sharpen the entering class. A new basic training class begins at approximately the four-week mark. Unofficially known as the Hell Phase, this four-week introductory period breaks down the recruit through a series of impossible tasks and then rebuilds him or her through confidence courses, physical training, and conditioned marches. The recruit is taught unarmed fighting and melee combat. The recruit is also taught protocol (when to salute, the chain of command, proper modes of address), personal attention to uniform and detail, and the history of the Corps. During the first two weeks of Hell Phase, the recruit is not reachable by any individual off-ship in order to increase his or her dependency on fellow recruits. During the four weeks of Phase Two, the recruit becomes proficient in judging distances, estimating bullet trajectories, and the discharging of all small and heavy arms in the CMC arsenal. Recruits earn three levels of qualification on the service rifle: marksman, sharpshooter, and expert. Those that do not qualify on the rifle do not pass into the next phase. After becoming personally responsible in Phase 1, Phase 2 stresses teamwork. The recruit learns basic fire team and squad level tactics and practices them in live exercises. There is more conditioned marching, interrupted by close-order drill, and unarmed and melee combat training. By the time the one-week Phase Three begins, the recruit is now able to independently think, look, and act like a Marine. After a written test and medical physical, the recruit completes his basic training in a final 54-hour final examination called the Crucible. The Crucible tests all of the skills the Marine has learned by rigorous forced marches, sleep deprivation, and supervised malnutrition. To minimize contact with civilians and institute a sense of isolation, the Crucible is conducted on one of the Fleet's cargo ships. Those that do not pass the Crucible will be remanded to Phase One. Those that pass graduate from recruit basic training continue onto a separate, usually three-week, advanced individual training (AIT). Rifleman: Use of the service rifle, grenade launcher (both underbarrel and stand-alone), and squad automatic weapon (machine gun). Additional education in tactics, which qualifies the individual for higher leadership positions. Connects to a fighting position in a squad. Demolitions: Use of high explosives. Connects to a fighting position in a squad. Field communicator: Understanding of the communications net, wireless signal theory, and proper radio protocol. Connects to a fighting position in a squad. Military policeman: Understanding of the Uniform Code, effective use of non-lethal weaponry, and investigative skills. Connects to a posting in the military police detachment. Combat medic: Knowledge of emergency intervention medicine. Connects to a posting in the combat medicine detachment. Marines in AIT become apprentices and combine traditional training and classroom instruction with on-the-job experience. Regardless of specialty, a central dogma of the Corps is that all Marines are riflemen first, so all AIT graduates train for a portion of the time for the rifleman position. The Platoon CO is normally assisted by a headquarters unit consisting of four staff officers, their aides, and some other sundry clerks and administrative personnel. Each officer has a particular area of expertise and counsel the company CO in military matters. Contrary to the Colonial Fleet, which makes a formal distinction between line and staff officer, all Marine officers are authorized to command a combat unit. Staff officers, however, rarely exercise this ability and do so only at the pleasure of the CO. The S1 is the company commander's primary assistant, or adjutant. He handles all personnel and administrative matters, including transfers, shore leave paperwork, promotion and award ceremonies, personnel evaluations and correspondence. The S2 handles intelligence and counter-intelligence for the marine detachment as well as security. Note that the S2 is responsible for the marines, and not the entire ship. On intel and counter-intel he would work with the Navy Tactical department. Even in terms of shipboard security, his authority is limited and wide-sweeping changes must go through command. The intel aspect means getting information to the CO and S3 so they can plan a mission. This includes things like weather and terrain data, enemy troop deployments and numbers, enemy strengths and weaknesses. Coordinating recon operations. The counter-intelligence aspect means thwarting enemy espionage activities. Reviewing marine security clearance applications, ensuring that classified documents are kept secure, maintaining computer network security, etc. The security aspect means overseeing the Military Police detachment, the brig, criminal investigations, and general shipboard security matters. Guard rotations, arms locker security, prisoners and interrogations. Much of the day-to-day duties are handled by the Master at Arms, but the S2 has ultimate responsibility for making sure everything gets handled. If the MAA is the Sheriff, the S2 is like the Police Commissioner. More bureaucratic than hands-on. The Operations officer is responsible for the company's operations, plans, and training. He is the commander's main assistant in battle planning and coordination. This usually requires a great deal of coordination with the other company officers. The Logistics officer is responsible for making sure that the company has the necessary supplies they need. On the Battlestar, this entails things like maintaining the stores and doing equipment checks. In the field, the role expands to cover supply drops, transportation, food and water - everything that's needed to ensure that the troops have the gear they need to carry them into battle. The chief MP NCO aboard a ship is the Master at Arms, informally known as the Sheriff. Although the Master at Arms supervises the military police staff, they ultimately answer to the battalion S2. Military policemen are the only enlisted group empowered to detain individuals. In fulfilling the first duty, the Master at Arms coordinates sentry rotations with each platoon sergeant to ensure that the Battlestar is adequately guarded and patrolled. This is one of the few established routines that do not involve officer participation. 1) Internal security of the Battlestar in general. 2) Security of armaments and the arms locker in specific. 3) Security of the brig in specific. 1) Access to personnel from other marine platoons for the express purpose of internal security, including maintaining the security of the above specific departments (through coordination with the other platoon leaders). 2) Control the dispensation of armaments in accordance to military policies, unless otherwise dictated by command. 3) Control the movement and conditions of prisoners within the brig in accordance to military policies, unless otherwise dictated by command. 4) Provide reccomendations regarding potential compromises in security to command, including personnel traffic. 5) Investigation of criminal activities that may have occurred on the ships. 6) Supervision of the other marines in the Military Police detachment. 7) Civilian/Military incidents. If Civilian, they are routed through those Security personnel on each ship. Military personnel are under the jurisdiction of the MP's. The MAA reports directly to the Marine Company S2. Trained as Marines and educated as medical staff, the combat medic occupies a peculiar middle ground, separate from the Hestia's Medical Department. Medics are embedded within the infantry platoons, and there are two assigned to the basic training program. In addition to the medics, at least one soldier in each squad is trained as a "combat lifesaver", which is essentially a mini medic. Historical note: Originally the combat medics were in a separate detachment, reporting to the company S1. During the reorganization after the Picon settlement, they were simply distributed throughout the marine infantry squads (usually one or two per platoon). Combat medics are trained somewhat between the EMT and Paramedic levels of medicine. It's training that takes approximately two years to complete in the civilian world, but in the military world is condensed into a 17-week Advanced Individual Training course. Administering certain emergency medications, including antibiotics, morpha and serazone. Other medication can only be given under a doctor's orders. Combat medics do not regularly work in sickbay, but pull occasional shifts to keep their skills sharp and help out. They are marines first, medics second. Team Leader (TL) The team leader executes instructions from and assists the squad leader in the performance of a task. The TL controls the movement of his fire team and directs areas of fire. The TL is typically a lance corporal or corporal and is a rifleman. Rifleman (R): The rifleman is armed with with a carbine or assault rifle. Given the heavy armor of the Centurions, the assault rifle is usually the weapon of choice. Automatic rifleman (AR): The automatic rifleman is armed with a squad automatic weapon (machine gun). The high stopping power and rate of fire of the SAW make it ideal for confronting bunched groups. Designated Marksman (DM): Each Platoon in the Corps has two DM's. They are the sharpshooters within the Platoon and their rifles typically have better sighting systems and are more accurate than the ones afforded to the standard Rifleman. They started their careers as Rifleman and were hand selected for these assignments. They serve at the deployment of the Marine CO. If necessary, one squad member certified in field communication is given a long-range backpack wireless and acts as the Wireless Operator (WIRELO). A Marine's team assignment and role is not static and may vary from operation to operation. The most senior Marine officer on duty is assigned the title of Marine Officer of the Watch (MOW). The MOW functions as the commanding officer of all Marines currently on duty and is responsible for resolving any problems that may require Marine involvement. He or she is directly commanded by the Combat Information Center, even if the CIC is staffed by Fleet personnel of lower rank. The Marine Officer of the Watch can issue orders to Marines not normally under his command. However, if the MOW cannot resolve a situation or if the situation warrants further attention, it is his or her responsibility to activate the next-senior Marine and transfer the title to that individual. All marine officers rotate through taking turns as MOW. 3. I will report violations of my special orders, emergencies, and anything not covered in my instructions to the Marine Officer of the Watch. Only the company commander, the Marine Officer of the Watch, or a military officer of grade O-5 or above may prematurely relieve a sentry of his or her post, and this action is required to be documented after the fact. Any order given to a sentry that would compromise his or her duties as outlined by the General Orders may be ignored and reported to the Marine Officer of the Watch. Finally, sentries are expected to be seen, not heard, and should not carry on conversation or otherwise convey the impression of lax attention. Each day is divided into three, eight-hour watches, with each watched manned by a platoon. The odd platoon out does training exercises and devotes one fireteam on each watch to supplement security on the civilian ships. The platoons rotate so that no one platoon is constantly stuck with the night shift, and so that each gets a turn for training. Because a squad is cumbersome to maneuver aboard ship, the operational unit during condition three cruising is the four-Marine fireteam. In a typical watch, four fireteams perform fixed patrols, guarding critical areas, two fireteams perform roving patrols throughout the ship, two fireteams are assigned to civilian security and one fireteam remains on deck eleven to act as a rapid response team. Active military policemen are usually given some autonomy to perform their own actions, but they are subject to assignments as dictated by the MOW, and may form security details to investigate disturbances not serious enough to warrant an alert team. Any officer may arrest an individual of equal or lower rank in accordance with military law. Military policemen, being enlisted, are not entrusted with the power of arrest. However, they may perform a similar action, called detainment, which has the same physical effect as an arrest: the individual is placed in irons and transported to the brig. Detainment, unlike arrest, is non-binding and lasts for a maximum of three hours. During this time, the detaining MP is expected to contact the detainee's commanding officer, who will then make a decision on whether to arrest or not.